Published February 11, 2019 By Anna J. This post may contain affiliate links. Regardless, I only recommend sites I've researched and/or used and trust. Today, we're talking about Verblio, a site you can write for from home and get paid every week. As a writer, I am often wary of any new paying platform for writers. I frequently lean towards setting my own rates, finding work on job boards, via word-of-mouth and my own reviews, my website and social media/marketing efforts, and through recommendations in private forums or at networking events. The company touts its ability to create “on-demand” content that is SEO-friendly – so, it basically makes the same claims any other agency does in terms of its blog content. Another important note: Verblio was formerly called “BlogMutt,” which, according to a previous post we wrote about it, was founded in 2010 by a team of two, who then started hiring writers a year later. The team is still small, according to the messages I received when I signed up for the platform, citing only six people working for the business. After signing up for the platform, taking a brief grammar and plagiarism test (Verblio has strict anti-plagiarism procedures in place, i.e., no rewording articles, even slightly, and you must always apply an attribution to quotes), you will write posts based on keywords the Verblio clients provide. There is usually a couple of paragraphs stating what the Verblio client needs in regards to content, and links to their social pages. Prior to writing, you should do research using the sources the client provided to be able to write the best possible content for them. You can also see whether or not your posts were accepted or rejected, but you can’t see who wrote the feedback. Here’s the thing about agencies like this one: sometimes editors for sites like this are overworked and possibly underpaid, so the feedback that you get may not be the most constructive (please note that this is all supposition on my part, based on my prior experiences – Verblio could have fantastic editors!). You may not get the feedback you want or even need to grow as a writer. These editors have hundreds of blog posts to get through daily, so don’t be discouraged if their feedback is clipped. Use this work as an experience or resume boost. Related: 200+ FREE writing niches to consider – huge list! Speaking of building your portfolio: before you even sign up, see if you can get in contact with someone who works at Verblio, either through the website or LinkedIn, and ask them if you can use client work in your portfolio. They do have a checkbox within their submission process that you must check to move forward; it basically states that you’re okay with not having your name attached to any content. Sometimes agencies can be flexible on this point with their ghostwriters, depending on items like non-competes and non-disclosure agreements. But if they’re not budging, then you can just put on your resume and LinkedIn that you worked for Verblio for X amount of years or months as a contractor, and then keep track of how many clients you wrote for and Google your own articles to see stats like social media numbers. You can brag about your accomplishments without naming names! As a writer, you will earn $10.50 per post, but only once that content has been bought by a Verblio customer. This, to me, is the biggest con to Verblio – I would never work for this pay as a writer with 12+ years of professional experience; however, I have worked for this pay when I was just starting out (or, you know, wrote for practically free! ), and I understand how difficult it is to get your writing business off of the ground, and to get clients. But even if I was just starting out, I don’t like that Verblio doesn’t pay unless a client buys a piece that you wrote – that’s a lot of free work that you’re doing. We have a list of several other sites that pay weekly if you're looking for more options for weekly pay outside of Verblio! The biggest complaint seems to be that there’s no guarantee that Verblio will accept what you submit, which I also completely understand – that, and the pay, would be my biggest complaint(s)! Writers additionally state that there are no “pay grades based on writing quality,” which they seem to like, but multiple writers can submit for the same post, and the client chooses which post they like best – that’s a huge drawback in terms of having to compete to get your work published. Reviews are mixed because of the low pay, but some writers have said that they can average between $25 – $30 per hour; however, that was back when Verblio was BlogMutt. That same writer who averaged higher also stated that the complaints came from weaker writers, which could very well be true. Have you written in-house or remotely for agencies in the past? What has your experience been like? Would you write for Verblio? Let us know in the comments! Want to Go Into Business For Yourself as a Writer? Here's a Free Download! This is the most profitable route to take as a freelance writer. You can get your own clients and set your own rates, which you cannot really do with the content site listed above. A six-figure income is not outside the realm of possibility when you're running your own business. Not sure what you'd write about? You may want to grab a copy of Gina Horkey's FREE downloadable list of 200+ writing niches to consider! She's also written a very thorough and detailed guide on working for yourself as a freelance writer if you're interested in getting a lot more information on how to do this. Thanks for your thoughtful review of Verblio! I wanted to reach out and offer a few corrections so that your readers (and our potential writers) have all the information they need before signing up with us. First, pay does start at $10.50 for 300-word posts, but the scale raises along with word count. At the 600-word level writers make $21, at the 1,0000-word level writers make $50, and at the 2,000-word level writers make $130. For most of our writers, this equates to $25-30 per hour, but it’s the added benefits of not spending time or money on marketing, customer outreach, or logistics that really sells many of our freelancers on the model. Though many writers blanche at the idea of writing ‘on spec,’ our customer decline rate is below 10% and we provide our writers with the tools to recycle content if necessary. Also, we do not currently employ editors. While our internal team of 12 does perform routine writer reviews and quality assurance, we don’t have the ability to read every piece of content that comes through the platform. The feedback that is left on posts come directly from our customers, the people who ultimately use the content. Some know exactly what they want and how to communicate their needs/appreciation to a writer while others will assign a star-rating and leave it at that. We understand some of this feedback (or lack thereof) can be frustrating, but our open writer forum offers a great place for writers to share their experiences and recommend which customers to write for and which to avoid. Please visit our Become a Writer page (https://www.verblio.com/become-a-writer) for more information or feel free to reach out to me via LinkedIn with questions. After applying to Verblio, I was accepted after about a week. Sold two articles, had another five articles “in the money” or close to in the money (Verlio’s vocabulary) and another dozen or so pending. Made it to Level 2 and was halfway to level 3. Got an email from them requesting me to write another article for a customer that had purchased one of mine and then about an hour later got noticed that Verblio had decided my writing did not meet their standards and they could not accept me as a writer. No other explanation. Lot’s of hours wasted researching the customer’s I had written for. Since I had been published prior to working for Verblio and have had other requests for articles when I was still working my full time job, I am feeling a bit skeptical about Verblio. Thanks so much for writing this article! I had almost completely forgotten about Verblio until I read this. Like some other people who commented above, I discovered the platform when it was BlogMutt. I wrote several articles, which were all accepted and I was paid for. I loved that I didn’t have to handle the payment with the clients, and they were all very friendly. The pay was low since I was a low-level writer, but I think if I had stuck around and leveled up, I could have possibly found some consistent writing work. It’s something I’m considering looking into again, but it may be a hard pill for some full-time writers to swallow to write for those low rates in the beginning. Your post has me really thinking now! Verblio pays 3.5 cents per word, irrespective of the length of the article. So yes $10.50 for a 300-word article and proportionally higher for longer articles. Slight correction. $10.50 per work is for a 300 word (or slightly over) article. Once you’ve “leveled up” (through having articles purchased, written and submitted, and so on) you are eligible for longer articles that pay more. I came across Verblio when it was BlogMutt, wrote one article that sat for nearly a year. I’d pretty much forgotten about it by then, but that sale motivated me to take a closer look at the site and start writing more posts. Eventually, I found a couple of customers that liked my writing and for whom I enjoyed writing. I say that past tense because I’ve slowed down greatly. I slowed down because I’m not good at writing about just anything; I need to find the subject interesting. I realize that slows my moving up to a higher paying level. I’m not keen on the low pay and the whole wait-and-see-if-it-sells thing but it’s funny how posts have sold right when I needed a few extra dollars. I will say that I’ve found the Verblio team easy to communicate with; they were quick to get answers the few times I’ve had questions for the customers. The writers’ forum has a nice, supportive community feel to it. With one exception, the customers have been good about requesting edits instead of rejecting an article out of hand. I’ve cut back on the time I spend with Verblio because one of my favorite customers is no longer a customer, I’m not seeing many topics I want to spend time researching, and the time vs. pay ratio is pretty dismal. I’m gravitating towards a virtual assistant business and attempting to get onboard with nDash, a content writing service that believes writers are worthy of their pay, right from the start. I made it through all the hoops and wrote my first sample article, and it took three weeks to be accepted and purchased, even though mine was the only submission. I haven’t written anything else for Verblio because I don’t want to wait that long! Also, it’s hard to find clients that don’t have long lists of rejected work, and that is a risk I’m not willing to take. The pay would be decent for a newbie writer like myself IF it was more guaranteed. Definitely just a back-up gig or extra money on the side thing. Very informative, but I would like to add a few things. I am a writer at verblio.com, and the pay you quoted is the beginning pay for 300 word posts. As you progress, you move up in rank. I am a level 4 writer (almost 5) and I receive $21.50 per post for 600 word articles. I am also a preferred writer, meaning a client prefers my writing and will buy anything I write first which practically guarantees they will buy buy anything I write first over anyone else. As you move up the levels, your pay increases substantially and at level 7 you receive stock in the company. I am a full time student so I write when I can. I choose the subject and the client, and never have a deadline. Everyone is very supportive and the experience is priceless. 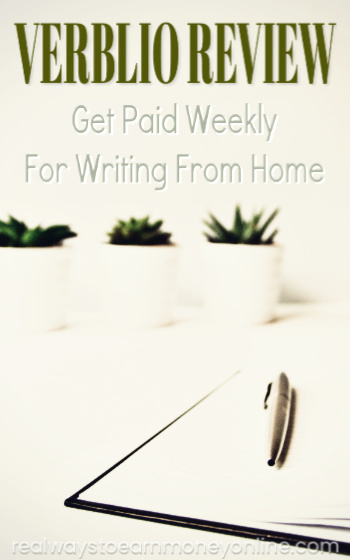 They pay weekly on time like clockwork, and for me, have boosted my confidence as a writer which is necessary to get those high paying jobs you speak of working as a freelancer. 300 words @ 10.50 = 3.5 cents per word. 600 words at $21.50 is 3.58 cents per word. Not really much of an increase.